This 30-mile loop takes you from the Byway west of Margaretville, along Route 30 beside the Pepacton Reservoir, up the Tremperskill Valley to the hamlet of Andes, and back to the Byway via spectacular Palmer Hill. At Margaretville, NYS Route 28 joins NYS Route 30 for three miles until Route 30 heads south. Turn left on 30 for a nine-mile drive above the largest of New York City’s upstate reservoirs. The Pepacton holds 25 percent of the water supply in a vast network of reservoirs and delivery tunnels which bring fresh water to nine million people. The Pepacton was completed in 1954 and covers more than 5,000 acres to a maximum depth of 180 feet. As you drive notice the signs denoting the former locations of communities claimed for the reservoir. At the Shavertown Bridge, cross over to enjoy the magnificent view of this inland lake. Stop at the parking area at the south end of the bridge to read more about the City’s water system and the history of former communities at the outdoor exhibit. Head back over the bridge and turn left on Tremperskill Road. Note the boat launch for anglers, kayakers, sailors and canoeists. Non-motorized boating is allowed on the reservoir, but you must first steam clean your vessel and get an access permit from the NYC Department of Environmental Protection. Twisty Tremperskill Road winds along a major feeder stream of the reservoir and is a lot of fun to drive – carefully! When you get to the historic marker at the intersection with Dingle Hill Road, you might consider a short side jaunt to the site of an 1845 murder that changed the course of New York State history. Tremperskill Road takes you to the hamlet of Andes. Turn right on Main Street, which becomes NYS Route 28. You’re back on the Byway! Drive through town, and head up Palmer Hill. 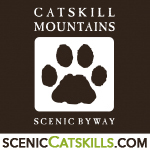 Stop at the parking area at the summit to enjoy the breathtaking view of Catskill peaks. This is also a hiking trailhead, so get out of the car and take a walk! 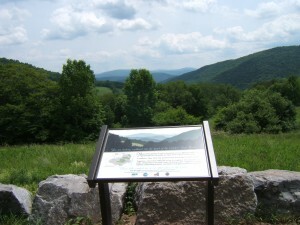 Continue south (east) on 28 down Palmer Hill to the starting point of this scenic side trip.